It would be an understatement if one says 2011 was the year of change. The year of revolutions, the year of power of the people, the year of realizing yes we do have the power to overcome and triumph. What has not happened in 2011? Families battles, world disasters, Arab revolutions, global movements, personal struggles & successes, and of course love, all took place in 2011, and sometimes all at once. 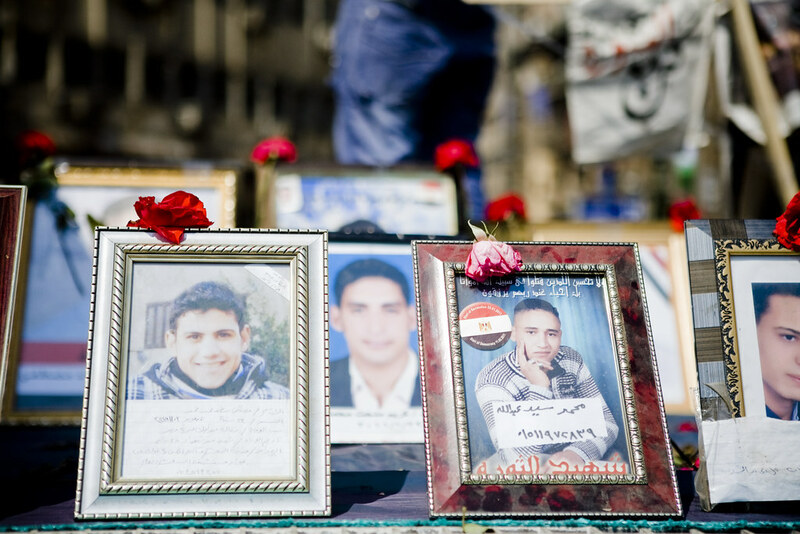 I saw death, I lived in Tahrir, I witnessed miracles, I went to places never thought were possible, I sprayed graffiti of Khaled Said on the gates of interior ministry, I lived. 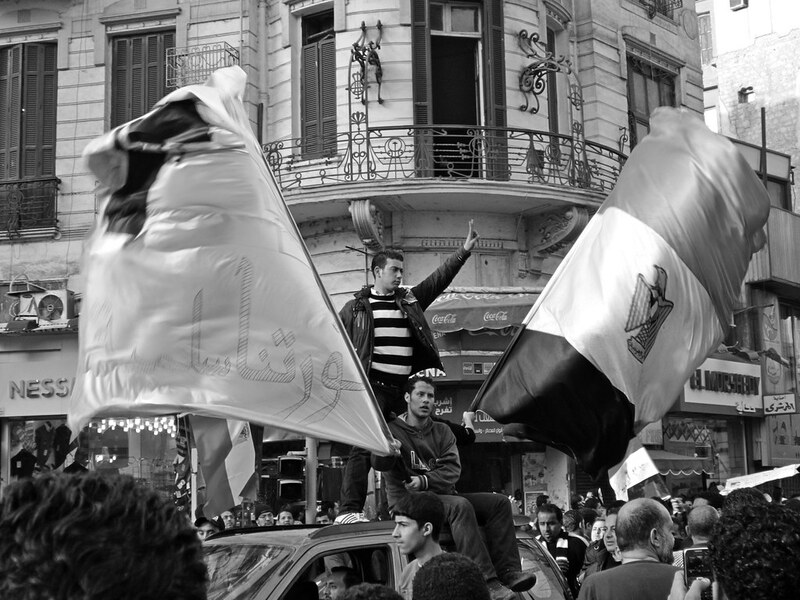 There are no words that can describe my pride and honor of having been part of the roots of the Egyptian revolution and still fighting for its victory. 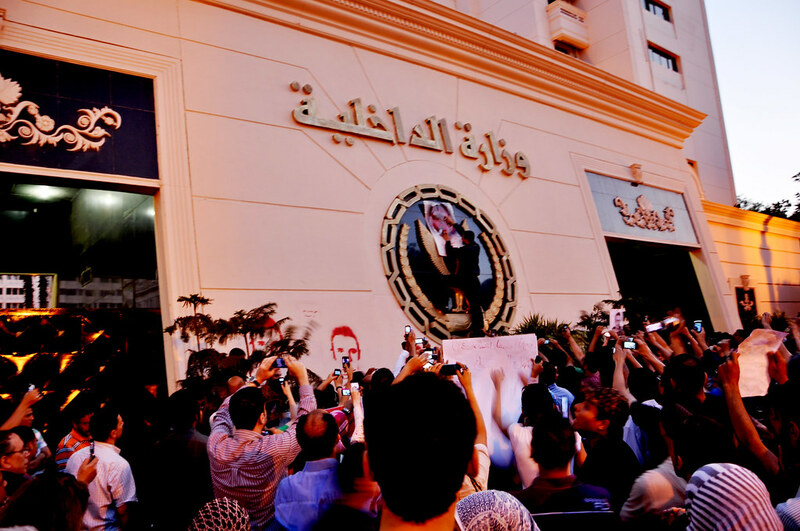 The days when we protested in tens in a cordon surrounded by thousands of riot police in front of the press syndicate or on the sidewalk somewhere, now seem now only like a small picture in an album book on an old shelf somewhere. 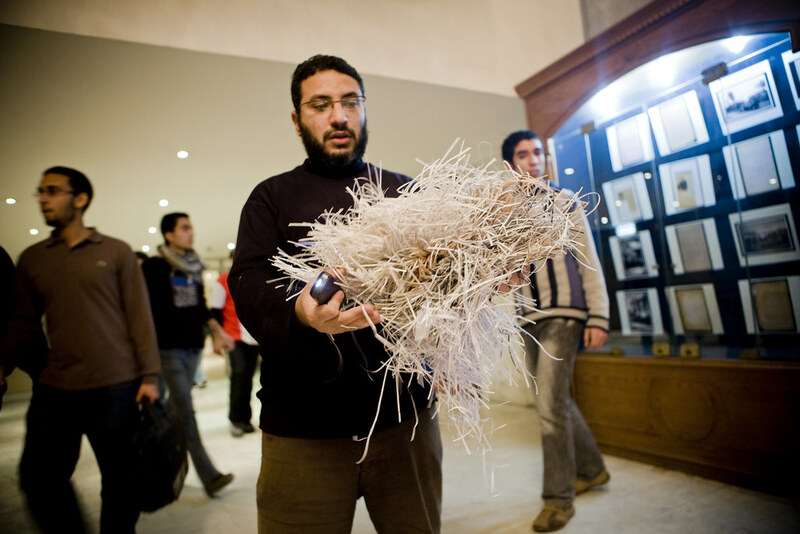 From the start of 2011, Alexandria church bombing 20 minutes into the year, this small picture forever changed. 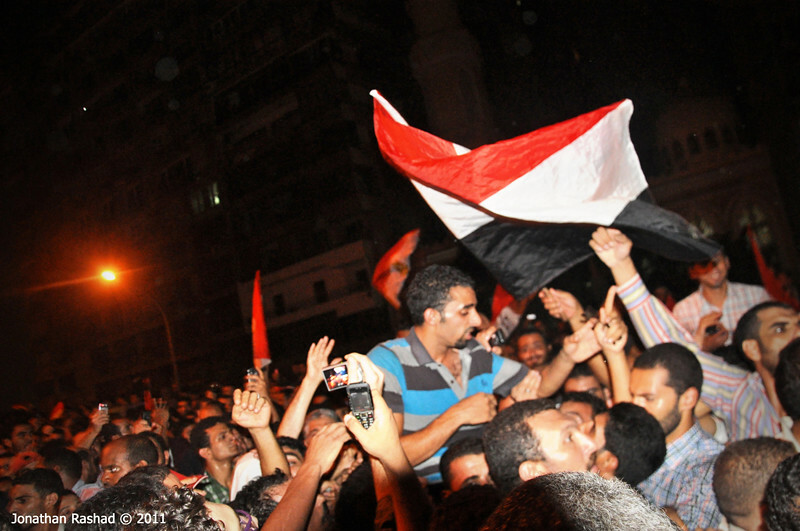 People poured into the streets fighting sectarian strife and showing Egyptian unity. Soon enough along came the step-down of Ben Ali, ex-dictator of Tunisia, 10 days later we were in Tahrir demanding the removal of regime, and 18 days further Mubarak, the dictator who terrorized us for decades finally stepped down. The sweetest moment of victory ever short-lived, knowing what we experienced for months after and until now by the extension of Mubarak’s dictatorship under SCAF. So many people around me are disappointed and discouraged with how things are turning out since Mubarak stepped down, but being part of how things were before the revolution makes me so much more hopeful now. 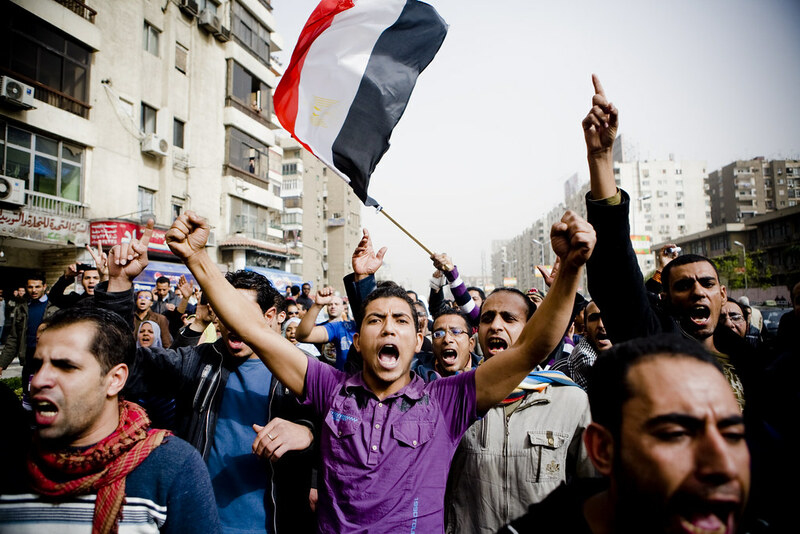 I always like to have the big-picture perspective on most events even in my personal life, and what I see now for Egypt is nothing less than greatness and unprecedented achievements in 2011 despite all the massacres and SCAF’s iron fist on Egypt. 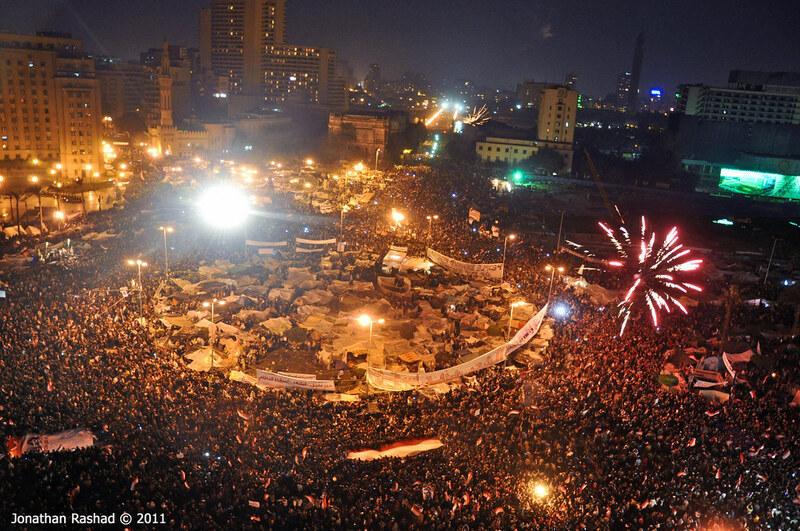 Pictures speak louder than words so instead of telling you all the events that made the Egyptian revolutionaries my heroes of 2011. 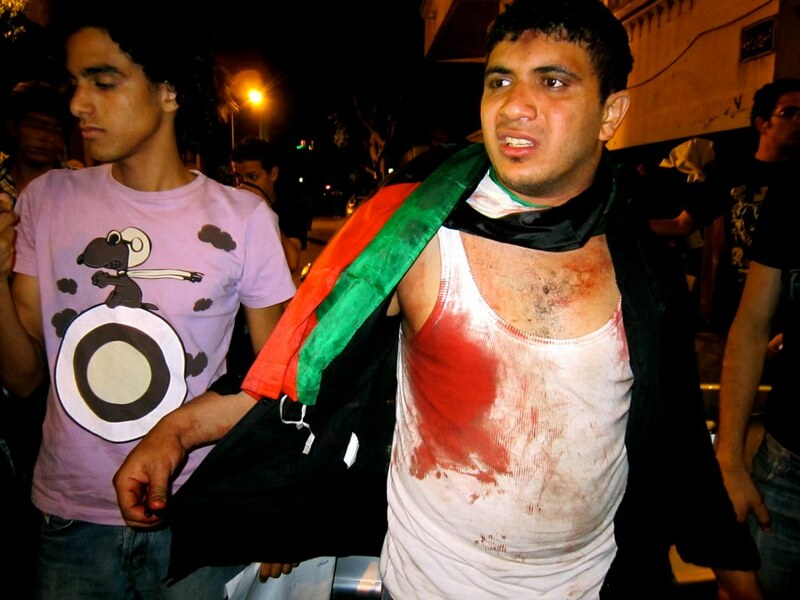 Below is the year of the revolution in pictures highlighting the most powerful images I chose for 2011. This is why there is hope, as long as we are breathing, we will fight for our freedom, social equality, and dignity. 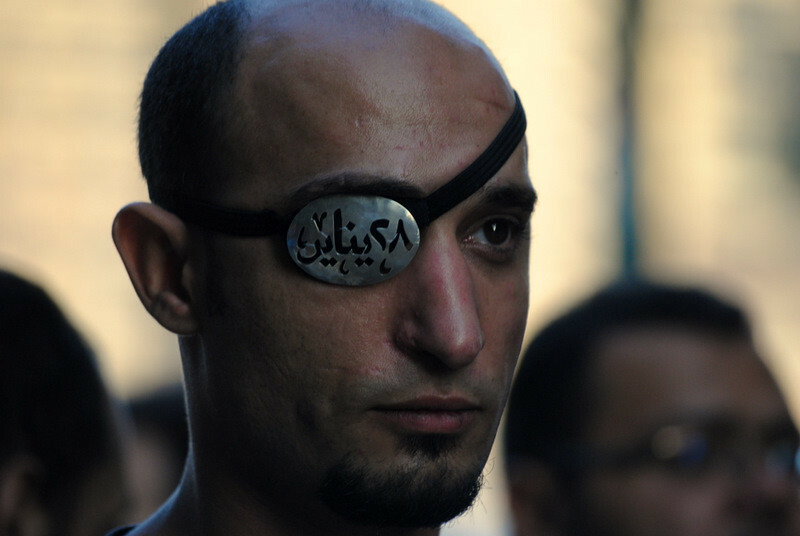 We die for freedom, but we live on hope & resistance. May 2012 be the year of freedom. Revolution until victory. There so much more ..but one video says it all. 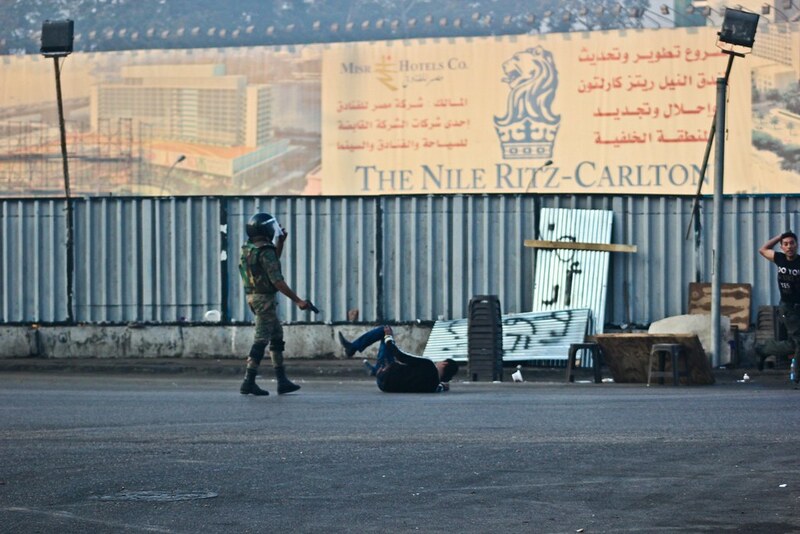 SCAF MUST BE EXECUTED IN 2012!!! With all the painful images above, I am not depressed nor worried. 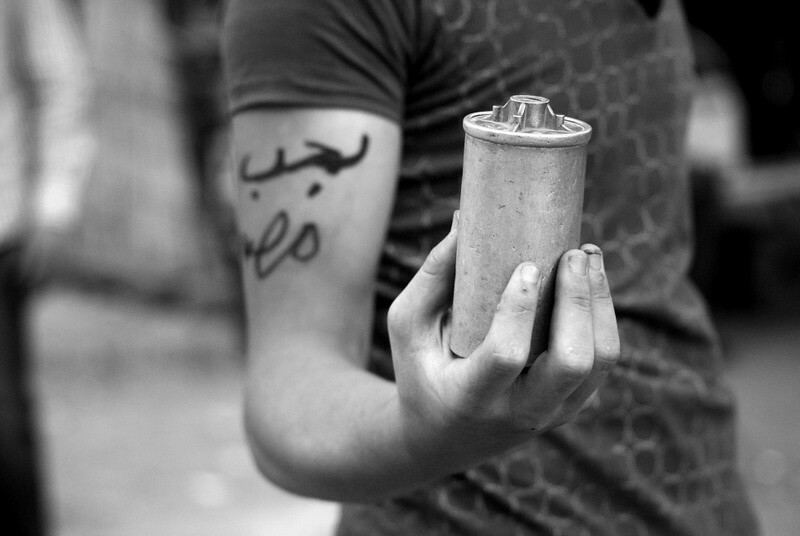 I have seen the strength, courage, and bravery of the Egyptian revolutionaries. 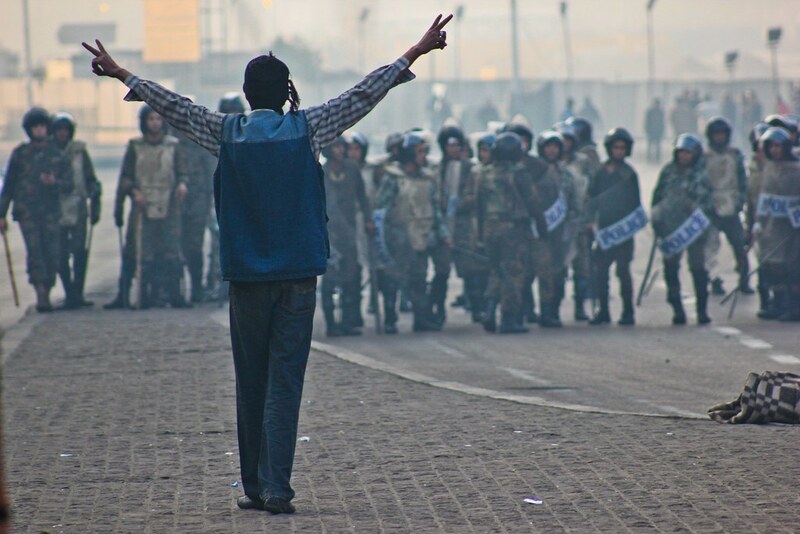 We never stop fighting, we never give up, we will continue until victory and I have no doubt that we will EXECUTE SCAF. June28: The Second Coming of Rage! 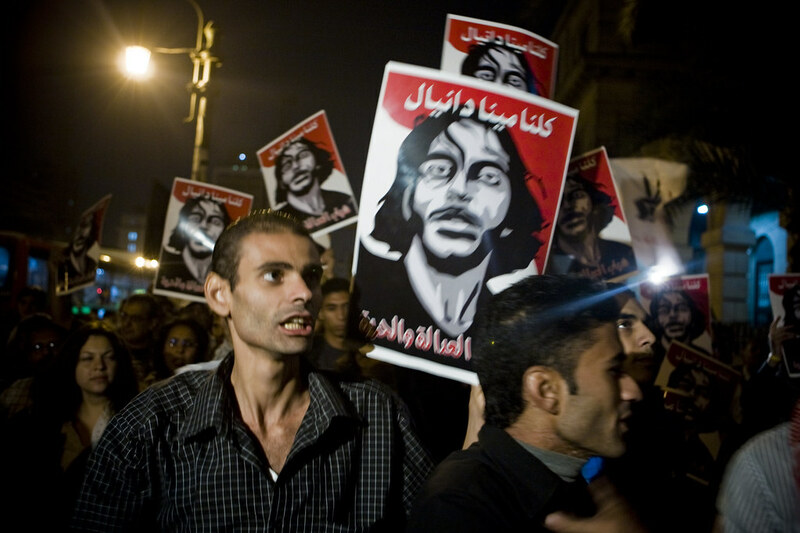 Around 6:00 pm I was at the families of martyrs sit-in at Maspero, I found the place somewhat unusually emapty, when I asked, I learned that a group of them together with supporters had left in a march to the honorary celebration of the martyrs at El Balon Theater in Agoza. I wasn’t able to figure out for sure who organized this “celebration” nor why have the families decided to go and leave the sit-in. 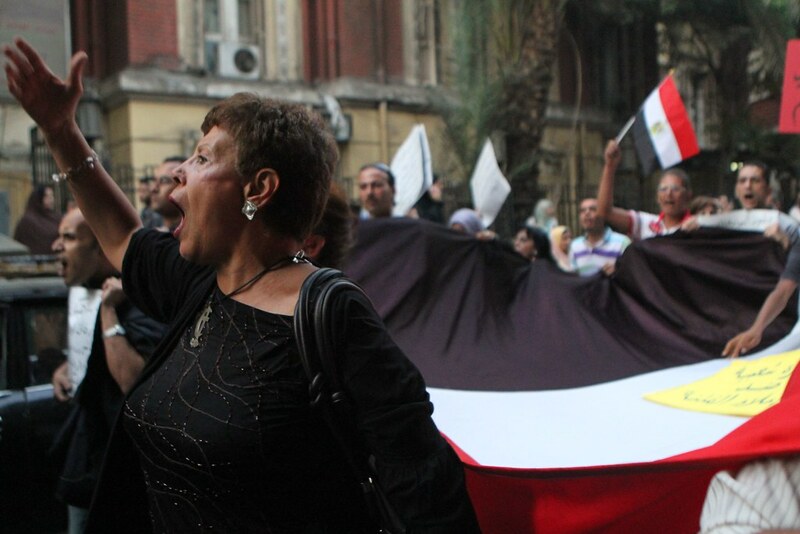 Soon enough, a group came back from Agoza telling the story and showing me the footage of police attacking the supporters from Maspero after the families & supporters were denied entry into the theater. 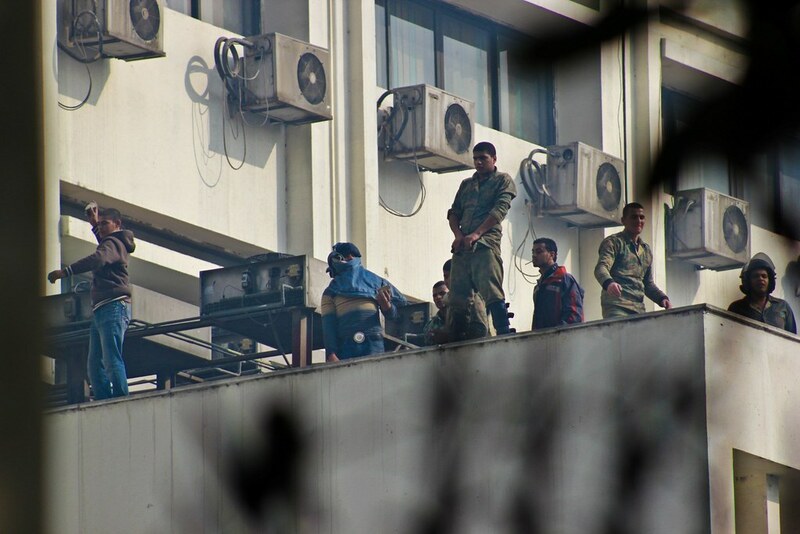 The families from Maspero along with supporters went to get into the theater, and they were denied entry by security saying that they are not the families of martyrs, so four supporters jumped the fence, and that’s when the clashes started. 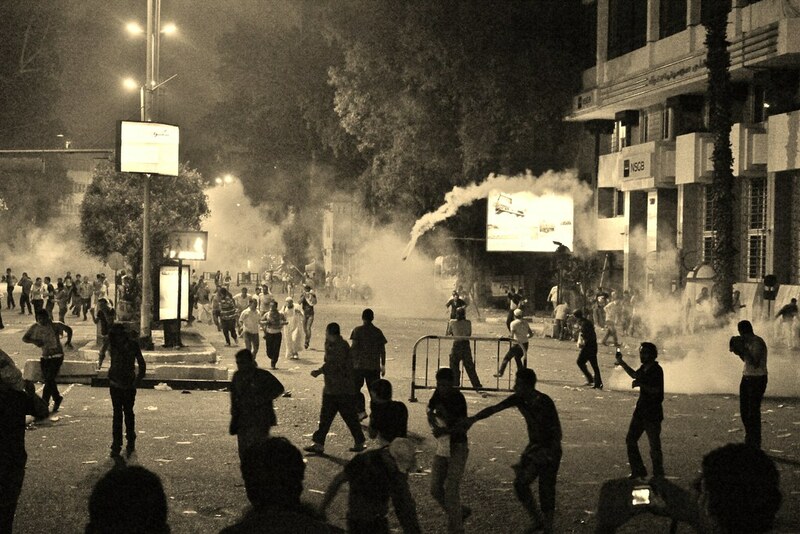 Immediately, the police showed up and started firing tear gas and attacking supporters & families of martyrs from Maspero with electric shocks shown in the video above. 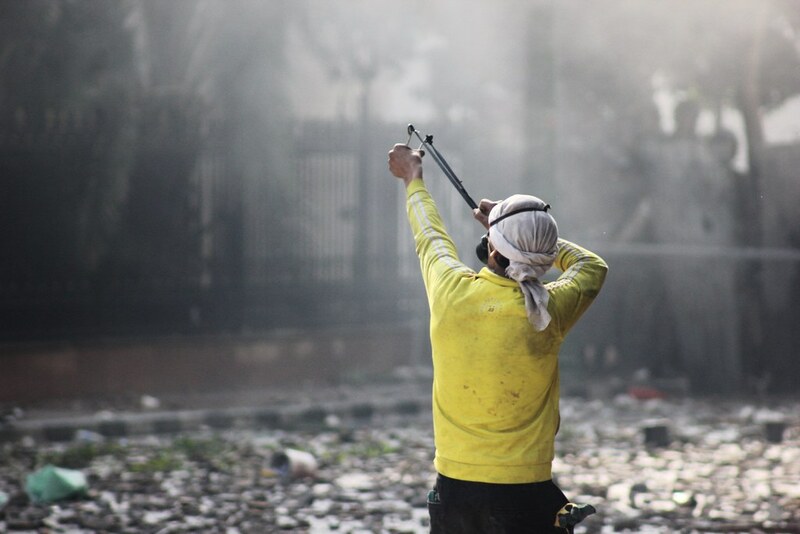 I took this footage and went to Aljazeera Arabic, uploaded it, and was promised that they would report it, and left. 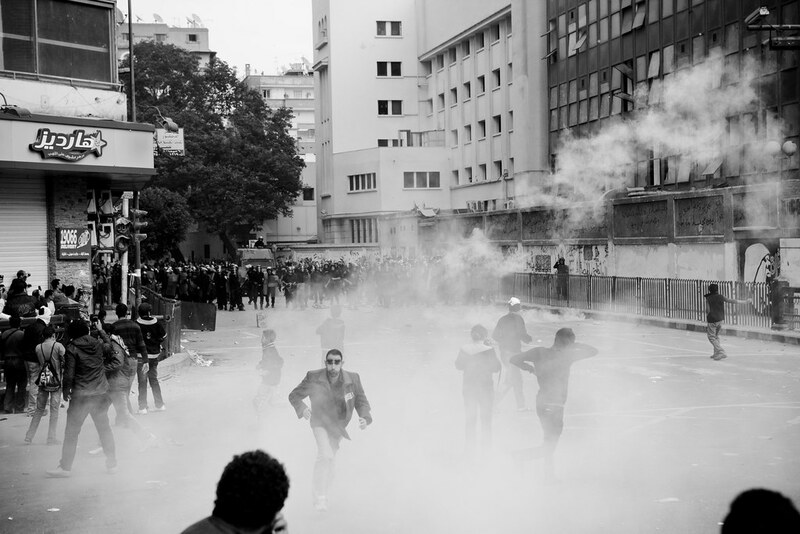 As I was passing through Tahrir, I saw a group of familiar Tahrir activists saying that they are going to the interior of ministry to protest against the police attacks in Agoza. There were 2 trucks with plain clothed people heading there as well. I wanted to pass first by the CairoTweetUp first then head to MOI, I showed the tweeps the video and left to MOI with @3effat & @Sarrahsworld. 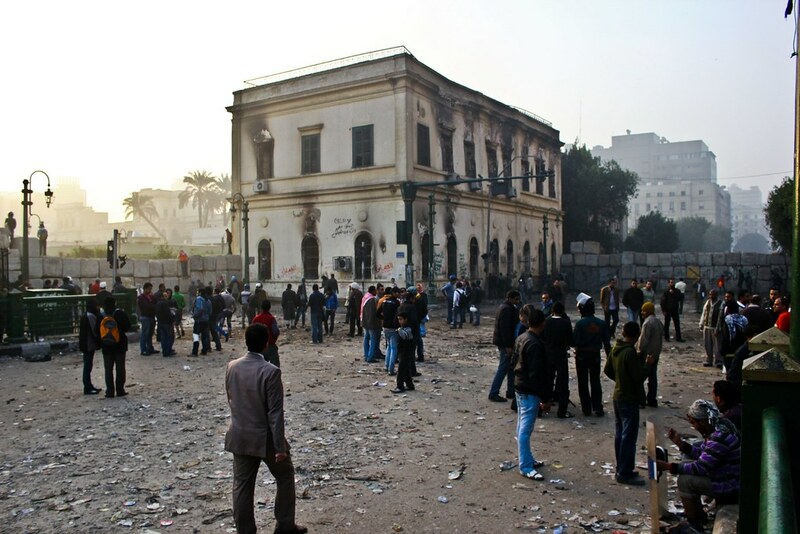 When we got to MOI, clashes had already occurred between protesters and CSF officers with an exchange of rocks throwing. I saw there @norashalaby & @Tahrekshalaby along with other familiar faces. 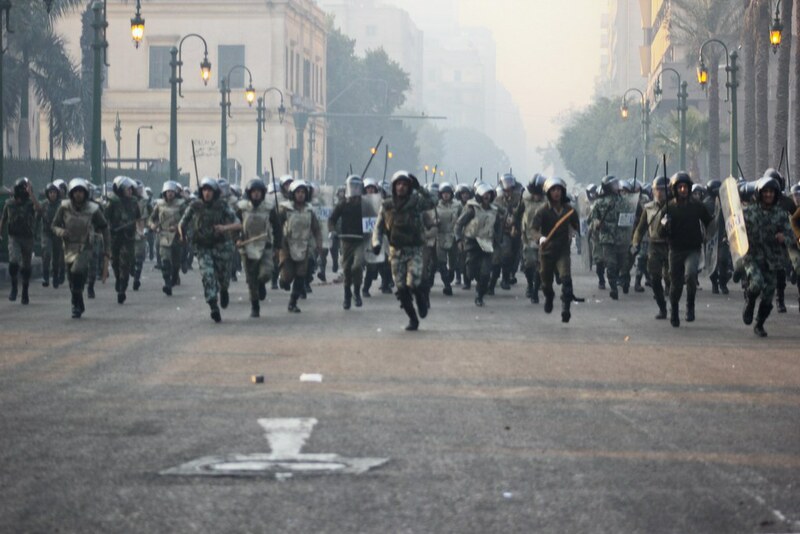 As things were dying down, all of the sudden, I saw the CSF officers marching with sticks in the air towards Tahrir on Mohamed Mahmoud St. The protesters followed them not understanding whom are they running after. I kept asking what is going on? People who were there before me, told me that “they are running after thugs who came and threw rocks at the officers in 2 trucks.” Hmmmm these must have been the same trucks I saw in Tahrir earlier, who are these people? unknown. 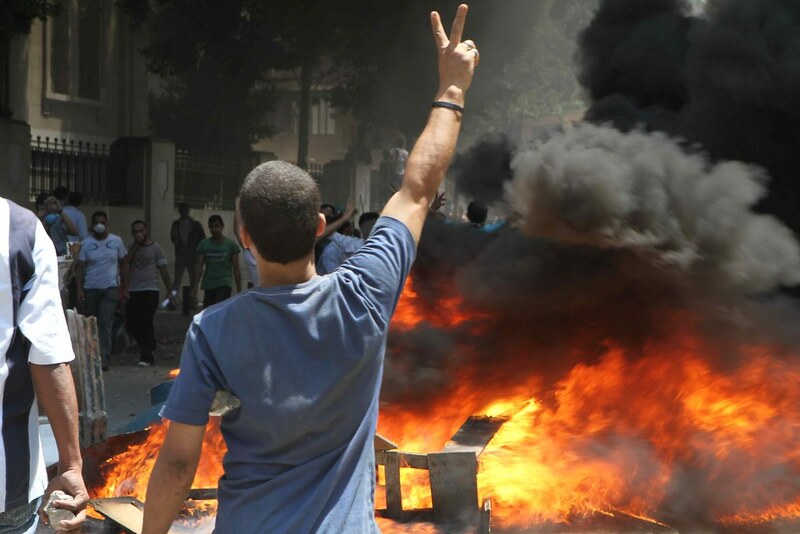 We, protesters, ran towards Tahrir, and clashes between us and them, pigs, never stopped since until now (noon June29th). Many were injured, including Noor Ayman @NoorNoor1, who was shot with khartosh in the head< but he is fine, just couple of stitches. One reported dead, Amr Osman. The most disgusting part was the cursing and the words that the CSF pigs were yelling at us while shooting us with tear gas and rock. They were saying, “we will kill you! you deserve death ya awsaakh!” I threw rocks for the first time from the front of the line. I was not afraid. I was ready to die because freedom is not without blood. 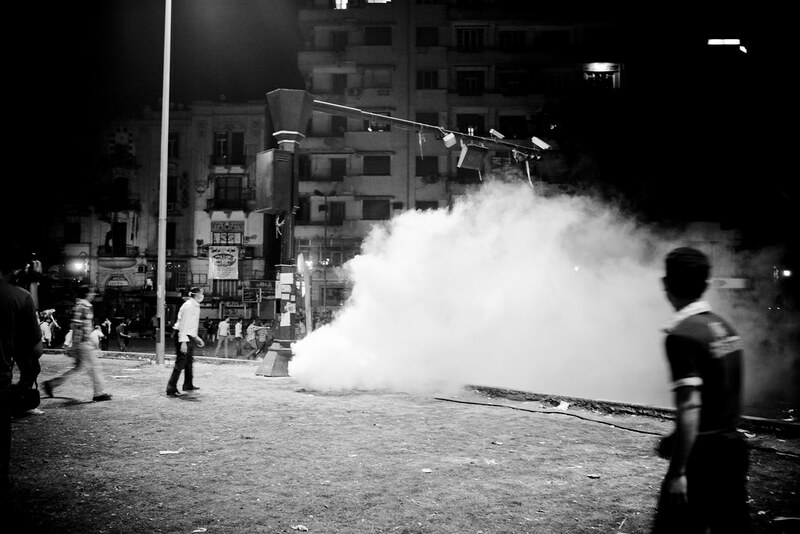 I got soficated with tear gas like many others including @alaa @Lobna @salmasaid . 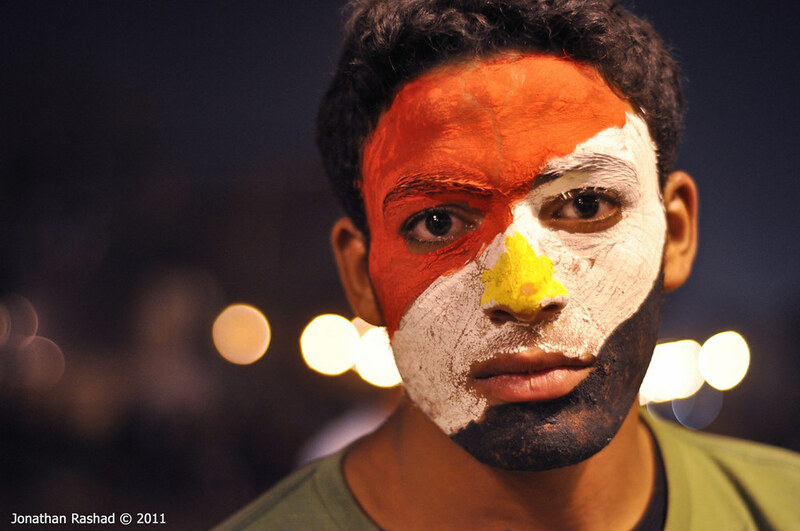 I left Tahrir to upload the footage that I have and the pictures that I took before my phone, camera, laptop, and flip all batteries went dead. You will find my videos from the night here soon. 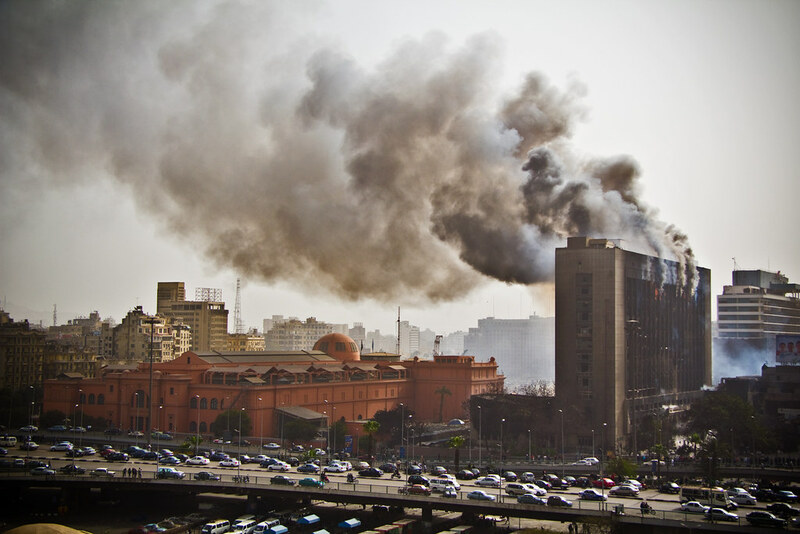 Gigi Ibrahim on the clashes in Cairo from matthew weaver on Vimeo. 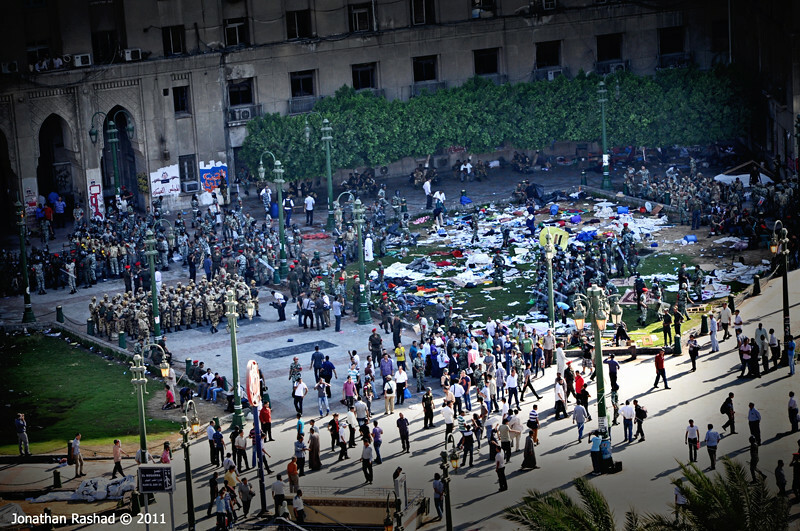 There is a call to stay in Tahrir, few thousands are there already, and more will join tomorrow. 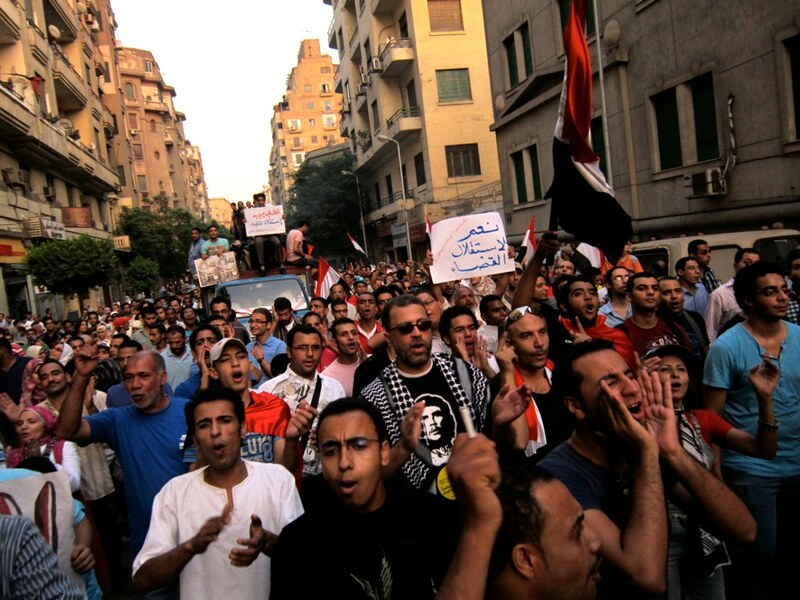 Alexandria, Suez, and Port Said also have mass demonstrations. Power of the people. Revolution until victory!! !